Wishing all of you a very Happy Christmas and a prosperous New Year!!! The holiday season is taking its toll and blogging has taken a backseat.Quite a few dishes were made during the last week and even though I was not able to post them ,I am happy that I have quite a few drafts ready during new year,when I doubt if I'll be cooking anything new! !First things first,its Christmas time and nothing less than a Christmas cake will do for this post,but before that a small intro. Christmas always meant joy and happiness.I feel its a festival that spreads cheer to one and all.Santa Claus,Christmas Carols and Midnight mass,all synonymous with the Xmas spirit.To us,Xmas always meant Fruit Cakes,or rather Plum cakes as they are known in Kerala.We used to get lots of cakes from our X'tian acquaintaces and friends and those days,I preferred to eat the Royal icing and pretty flowers on the cake not bothering to taste what was beneath it..what I missed all those years!! and again,we loved to have those pastry type cakes than the "hard plum cake" which we used to call it,though it didn't deserve to be called that at all! 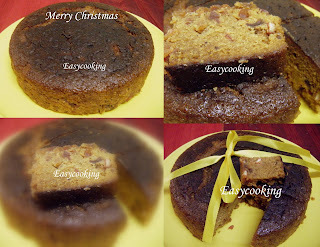 Ever since Mishmash posted the Traditional fruit cake recipe last year,I've been drooling over it.I knew that it was something which I could never make,it sounded too complicated and had many,many ingredients.But as I said,what is Xmas without an Xmas cake..? ?I kept looking at her recipe again and again and finally decided to make it.After the decision was made,I made a mental calculation-I had to have the cake on Xmas day and if I had to wait for four days to cut it,I had to make it on Saturday,it was already Wednesday and I had not even soaked the fruits! !Everything got done in a jiffy and by Thursday night fruits were soaked and the cake was made on Saturday night after two full days of soaking. The cake was made smoothly without any hurdle,but when I inverted it to cool,it started developing cracks.I have no clue how that happened,but one thing I can say-it tasted excellent.Almost like the readymade fruit cakes.I don't know whether I'll have the patience to make something as elaborate as this again when the whole city is bustling with cake shops selling fruit cakes..;-)! !Anyway,this Xmas,for the first time,we had a fruit cake which is 'homemade' and that makes me feel so good.Thank you Mishmash!! Purva's Daawat for the Christmas Feast!! Once again,Wishing you all a very Merry Christmas!! looks perfect divya..i am wanting to try this traditional one since a long time...will do it soon..
Wow..what efforts..LOVELY CAKE!Beautiful height n looks moist n tasty..my tiny bit of experience says might have had a crack due to less greasing/flouring..more butter is needed so that it slips out of tin easily..when only part of it slids out, the other part sticking firmly to the base, then too cracks happen..just a pointer..